The US has successfully bent its emissions curve: We estimate that US carbon dioxide emissions from energy consumption in 2015 were 11% below 2005 levels. While slower than expected economic growth played a role in this decline, the majority was due to improved efficiency of cars, trucks, buildings and appliances and displacement of coal and oil with renewable energy and natural gas. The 2020 target is within reach: Under current and proposed policies, the US is largely on track to meet its 2020 target. We project US GHG emissions that year will be 10% to 20% below 2005 levels, depending on the pace of economic growth, changes in technology costs and changes to US carbon sinks. 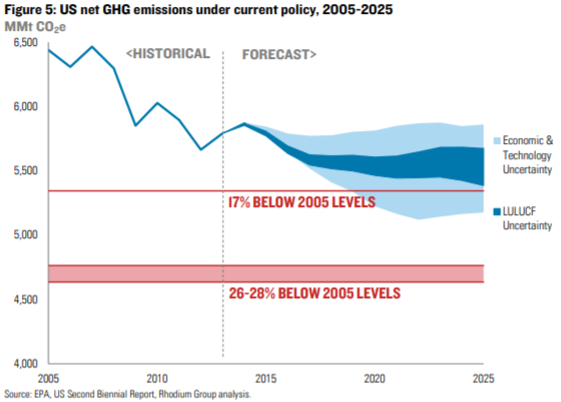 Meeting the Paris pledge will require additional action: Reducing emissions 26-28% below 2005 levels by 2025 will not be possible through current and planned policies alone. Even under the most effective policy implementation and optimistic technology and forest sink scenarios, we expect US emissions to be 23% below 2005 levels that year—leaving a 220-350 million metric ton gap. While the US still has nearly a decade to put additional policy in place, it will need to do so relatively quickly for the impact to be felt by the time the 2025 pledge comes due.